Hydromassage is a spa treatment that uses high-pressure water jets as massage tools. According to the Good Spa Guide website, the jets are more powerful than those found in a standard whirlpool tub or a Jacuzzi, and the water temperature is warmer. 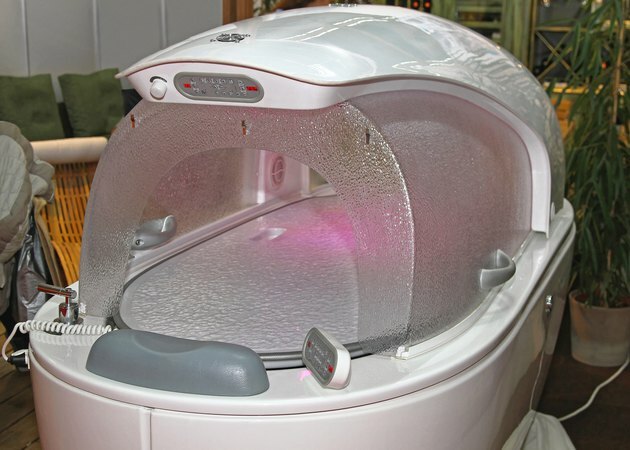 Traditionally, hydromassage involved immersion in water; however, some massage units now feature waterproof membranes that prevent the water from touching the skin. If you have heart disease or another medical condition, you should consult your physician before starting hydromassage therapy. You also should talk to your doctor or therapist first if you are pregnant, are recovering from an injury or surgery, or have high blood pressure. Avoid eating a large meal or drinking alcohol before your treatment. Hydro massage has been shown to reduce physical tension and mental stress, according to the Caldera Spas website. Immersing the body in warm water may reduce the secretion of cortisol and other hormones associated with stress. A study conducted by Washington State University's Bruce Becker, M.D., showed that soaking in a 102 degree F tub for 25 minutes produced relaxation and an accompanying decrease in anxiety. Hydrotherapy can help reduce insomnia and promote restful sleep, according to the Caldera Spas website. This may be because the body's internal temperature rises during hydrotherapy, then drops afterward. The internal temperature drop cues the body to get ready for sleep. Hydrotherapy can also improve sleep by relieving pressure on the body's joints and muscles, which reduces nighttime discomfort. Hydrotherapy sessions may help reduce chronic pain caused by arthritis, fibromyalgia and other conditions. According to the Caldera Spas website, the warm water improves circulation, which delivers oxygen and vital nutrients to muscle tissues. Water immersion also reduces the body's weight by up to 90 percent, taking weight off the limbs and joints. The water jets used in hydromassage therapy may also provide healing benefits by massaging injured, tense or sore areas. Water immersion and hydro massage may be a useful tool for people who have heart conditions. According to the Caldera Spas website, hydromassage can increase the heart rate without a corresponding increase in blood pressure. It can also increase the efficiency of the heart's pumping muscles, says Dr. Bruce Becker.